CH Consulting Group can support your business through strategic, consultative services for call center consolidation. We can examine the current state of your call centers and develop a consolidation strategy that would best drive efficiencies in five primary areas: operations, technology, facilities, and processes. The goal is to convert your core company competency (ex. Customer Care of Sales) into a consolidated, strategic asset and improve standardization and efficiencies company-wide. Return on Investment and ROI based modeling, if needed – Where there is opportunity to run modeling based on recommendations that will result in improved cost management and/or KPI improvements, CHCG will provide assistance and samples of models to evaluate options on process, technology, work force management and workflow improvements including outsourcing scenarios. 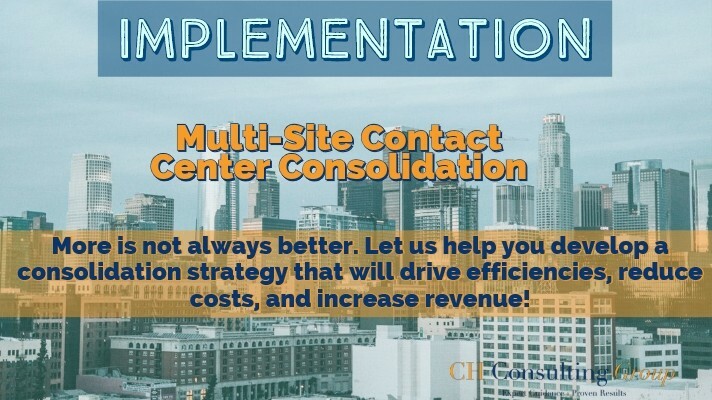 High Level Call Center Consolidation Strategy – Based upon the initial assessment CHCG will provide a high-level call center consolidation plan with recommendations that will employ a disciplined, systematic approach that provides you with significant operation cost savings and gained customer experience benefits including draft technical requirements. If you are in need of a multi-site call center consolidation strategy for your business, I’d love to learn more about your needs. Please make sure to fill out a form today for a free proposal!